Thomas Flaherty (21) and Matt Tepedino put up a stout defense. 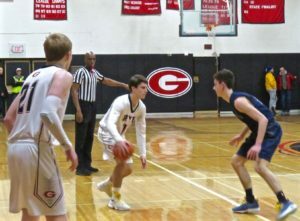 It was pandemonium inside Rye’s standing-room-only gym Friday night when the league leaders from Byram Hills drove down to take on the team just behind them in the standings, the Rye Garnets. And it was bedlam outside the gym, as more than 100 fans—many of them there to cheer for the visitors—were stuck outside in the cold with no way to watch the game. A Rye police officer told of stranded fans plastering dollar bills to the glass in the doors as bribes to get inside. Eventually, those who hadn’t succumbed to frostbite were allowed in thanks to Rye’s Principal, Dr. Patricia Taylor. Allowed into the school, but not into the packed-to-the-rafters gymnasium. 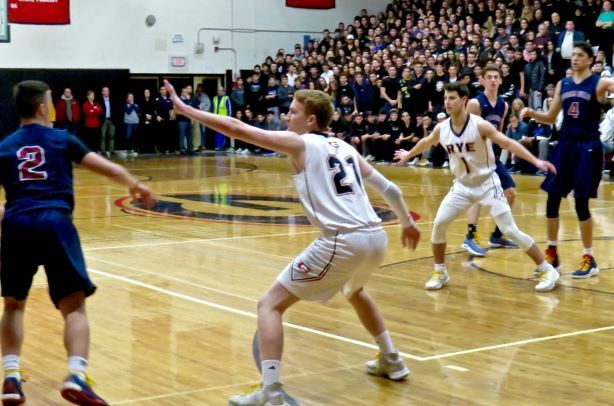 Those lucky enough to squeeze their way in were treated to more than a great game of high school basketball—it was an amazing show. The Garnet fans wore big red G’s on white T-shirts; the Byram section sported midnight blue, the color of their insanely tall team’s uniforms. Both squads wore gold shoelaces to remind everyone of the fight against pediatric cancer. Head Coach John Aguilar’s young son Jason served as Rye’s honorary captain. To mark the occasion, he sported a Garnet G shaved in the back of his head. And then Rye High senior George Szwajkowski nailed a Jimi-esque rendition of the National Anthem on his electric guitar. Hendrix wrapped up Woodstock half a century ago; George’s effort simply kicked things into a higher gear, with the students in the stands singing along. When the refs blew the whistle to start the game, nobody…apparently…told Byram Hills. They won the opening tip, but Ryan Lopp almost immediately stole the ball. Quinn Kelly hit an eight-footer, and the Garnets were off to the races. In a blur, the home team stole another pass for a score, Lopp wormed his way inside for a layup, Zack Rosenstadt came in for Troy Egan after two early fouls and swished a three-pointer, Matt Tepedino drove for two, Thomas Flaherty drew a charge and, when the smoke had cleared with 94 seconds left in the quarter, the score was Rye 14, Byram Hills 0. Nada. Zilch. The rest of the game was a matter of the much taller Bobcats—who entered the game with a 5-0 league record and an earlier eight-point win over Rye at home—slowly working their way back into the game. It was 30-19 at the half and 40-32 Rye after three. Ben Leff and Mike Parrotta, both half a head taller than anyone Rye could put on the floor, started clearing the boards. Even shooting guard Willy Samsen, at 6’4”, was able to grab rebounds over the smaller home team forwards. Lopp, though, would take down 10 rebounds for the game, keeping things somewhat competitive. All the while, the immense crowd noise was such that Coach Aguilar resorted to holding up pictograms of the plays he wanted his team to run. They included a chili pepper and the logo from a pair of Michael Jordan shoes. Rye continually changed their defenses, using different zones to try to keep the bigger visitors off the boards. After 75 seconds of the 4th quarter, the lead was down to 40-36. A Kelly score and two by Tepedino, all three the product of foot speed and hard work, made it 46-38 with 2:29 to go. Game over? Not by a long shot, which is exactly what Parotta hit to slice the margin to two with 13.6 seconds left in the game. Thomas Flaherty hit one of two free throws to make the score 47-44 with seven ticks left on the clock. Coach Aguilar called for a match-up zone, and Lopp got his fingers on a pass for the turnover that sealed the win, atonement for blowing a wide-open layup moments before. The score sheet showed Kelly and Tepedino combining for 29 points to lead the Garnets. Rosenstadt hit two treys for a crucial 10 overall. The victory left 15-3 Rye in fifth place overall in Class A, a skosh behind the Bobcats in fourth. Horace Greeley, a team the locals beat 63-61 earlier in the season, is third, while 17-0 Tappan Zee and fellow Class A unbeaten Poughkeepsie hold down the top spots. Rye travels to league foe Eastchester Thursday at 4:30 before hosting 4-12 Saunders Saturday at 6:30 p.m. in the final game of the regular season.